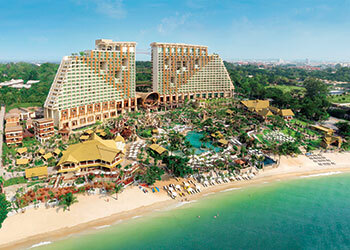 Centara Grand in Pattaya, Thailand ... Deira islands to get the region’s first Centara resort. UAE master developer Nakheel and leading Thai hotel group Centara Hotels and Resorts have signed a joint venture agreement to create a 550-room, Dh500-million ($136 million) beachfront resort with a waterpark in Dubai, UAE. Under the agreement, signed in Bangkok by Nakheel chairman Ali Rashid Lootah and Centara chairman Suthikiati Chirathivat, the two companies will deliver an upscale resort on a prime stretch of beach on Deira Islands, Nakheel’s new, 15.3-sq-km, world-class tourism, leisure, retail and entertainment hub. Nakheel’s joint venture with Centara is the latest development in the company’s aggressive expansion into Dubai’s hospitality sector and its second international joint venture for Deira Islands. The first, an 800-room, Dh900-million ($245 million) all-inclusive resort and waterpark with Spain’s RIU Hotels & Resorts, was confirmed in February last year. As the first Centara establishment in the UAE, the new resort will cover an area of 295,900 sq ft. Features include a waterpark, dining facilities, business centre, kids’ club, spa and fitness centre. The resort is anticipated to have soft opening in 2019 and grand opening in 2020. Centara Hotels & Resorts is part of Central Group, one of Thailand’s most prominent family-owned conglomerate holding companies that is involved in merchandising, real estate, retailing, hospitality and restaurants. Centara chairman Suthikiati Chirathivat adds: “We are thrilled and proud to be partnering with Nakheel on this joint venture hotel investment that will see Centara Hotels & Resorts operate and manage a distinguished new resort in an exciting new destination. Nakheel currently has over 5,300 rooms across 16 hotels, resorts and serviced apartments in operation or under development, with the first two – at Dragon Mart and Ibn Battuta Mall – delivered in 2016. Deira Islands, where Nakheel has already invested more than Dh3 billion ($816.5 million) in infrastructure work, coastal works and design services for a range of new projects, will add 40 km, including 21 km of beach, to Dubai’s coastline. Nakheel recently completed a Dh150-million ($40.8 million) access bridge to the islands, and has just released a tender for the construction of six marinas. The development is expected to have around 250,000 residents, create more than 80,000 new jobs, and offer hundreds of new hotels, serviced apartments and mixed-use buildings, and extensive retail and leisure attractions. Nakheel itself is building 16 residential towers, five hotels, two serviced apartment complexes, Deira Mall, Deira Islands Night Souk and several marinas at the islands.